The main characters of Battle of the Planets have received their own individual pages. 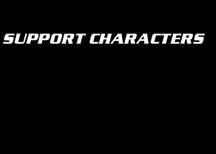 Named secondary characters that have only appeared in a few episodes, or those for whom we do not have much information are included in the Support Characters section. Each character entry features as much information as could be gotten from the episodes and occasionally from scripts. From the trivial to the most important, hopefully any question about a given character can be answered on their page. Unfortunately in most cases, there is not a lot of additional personal information that can be located. But this section should provide a simple way to look up facts to see when and where specific things relating to a character took place.